Ingenious design: Lilith Wozniak reviews the stage adaptation of Joe Simpson’s memoir. The stage adaptation of Touching The Void immediately sets itself apart from its earlier book and film incarnations through its structure. It begins with the imagined funeral of Joe Simpson, with the events leading up to his ‘death’ explained to his grieving sister by Simon Yates and Richard Hawking, the two men on the climbing expedition with him. While this is a canny way of framing the story, it never quite hits the right tone putting the play on rocky terrain for much of the first half. The emotional core of Sarah’s grief is never given room to breathe and the comical narration of Simon and (especially) Richard never quite works, the presence of a grieving relative, however imagined, always blunting it. The play also makes intriguing forays into fantasy, but the dialogue remains a little too anchored in reality. There are some lovely moments however, especially those involving teaching Sarah how to climb – her first proper climb sees her clambering up the side of the stage in a manner which uses the Bristol Old Vic’s impressive height more effectively than anything I have seen before. The clear exertion makes it more visceral and real than any effortless aerialist. And when it gets to climbing the mountain the play really takes off. The credit here is for Ti Green’s ingenious design. Both the initial pub set, arranged for clambering, and the skeletal structure, used when the climbers make it to the mountain itself, present a space that is exciting and playful. The whole climb in hideously affecting – even if you haven’t been on board until this point this will grip you, your heart climbing up into your throat. In one moment of horrifying violence all the different elements coalesce: the climbers, the grieving sister desperate for answers, even the seemingly comedic narration. The second half changes completely. Whereas in the first Joe appears only as flashback, here it truly becomes his story with the other characters mostly in hallucinations. Josh Williams puts in a fantastic performance in a gruelling role that involves having to make the repetitive and difficult process of Simpson’s return to base camp engaging for the audience. The problem, then, is that this part of the story may simply not be as suited to stage as it is to book or film. While the climbing sequences gain an extra level of tension from the physical bodies in the space with us, onstage Simpson’s long trek has neither the depth of internal exploration that can be afforded in a book nor the grand scenery and cuts that can be created in film. This production doesn’t really surmount this by showing what new perspective the stage can bring to this feat of extraordinary endurance. While there are certainly flaws to Touching the Void they don’t deduct the essential power of this incredible story. The script dips into slightly clichéd sentimentality at some points, but, for me at least, the fact I was rolling my eyes didn’t stop it bringing a tear to them. 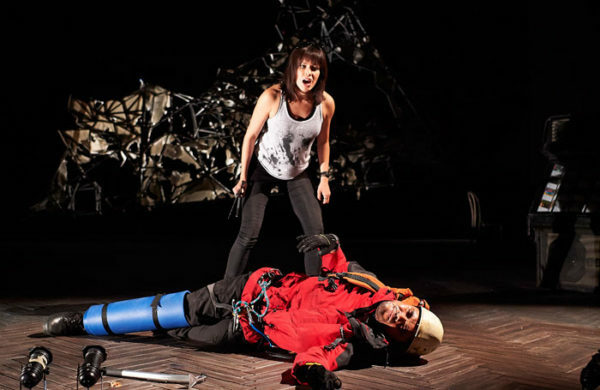 Touching The Void runs at the Bristol Old Vic until the 6 October 2018. Click here for more details.